How Do I Stop My Dog From Pawing Me All The Time? Has your dog’s pawing behavior gotten “out of hand” and now you’re wondering how to stop your dog from pawing all the time? Well, chances are, you may be part of the problem, because let’s face it, pawing in dogs is quite an endearing behavior and it’s difficult to resist a smart dog who in our eyes seems to be trying his best to adhere to our social etiquette. Putting the cutesy factor aside, in order to stop a dog from pawing at you all the time, you must first carefully analyze what it really going on through Rover’s mind when he insistently extends his paws at you. Sure, dogs are quite adept into learning new tricks, there’s no bones about that, but that pawing behavior in reality is a far cry from the typical hand shake people exchange with one another. It is common practice for humans to want to anthropomorphize and interpret dog behaviors as almost human-like. Yet, last time we checked, dogs preferred greeting one another tail-first, or at the most, they would rather engage in an amicable nose touch rather than pawing at each other. Pawing behavior directed at another dog’s face or shoulders is actually considered rude behavior when it comes to canine “etiquette” and may result in a growl or scuffle if carried out towards the wrong type of dog. And when it comes to meeting and greeting people, well, let’s say that dogs would rather prefer to sniff in some other “odorous” places instead! These are dogs who are likely to resort to using their paws to get their toys out from under a bed, open doors and cabinets (yup, keep those cabinets locked), clean their faces kitty style or toss a ball in the air. All dogs eventually end up finding some use of their paws at some point of their lives though, especially when using their mouth is ineffective and they are very determined to succeed in a particular task. Once they discover how effective using their paws may be, they will therefore feel more and more compelled to increase their level of “manual dexterity” when the need arises. Since pawing behaviors are quite natural, training a dog to give paw is fairly easy, especially when it comes to teaching those naturally born “pawsy” dogs out there. Even those dogs were aren’t much used to using their paws eventually get it, if you are persistent and entice them with a good incentive (eg. treats). What does this mean to dog owners? It means that since dogs are rewarded for pawing behaviors, dogs will be engaging in pawing behaviors more and more. This is a desirable outcome when it comes to training, as we want desirable behaviors to persist rather than extinguish. However, good trainers know that dogs should perform desired behaviors only and exclusively when the trainer asks for them. Failure to adhere to this very important rule can make a difference between a dog who paws when asked to and a dog pawing at his owners anytime he feels like it, which, as much as we love our dogs, can get quite annoying at times. Sure, you are not giving your dog treats when he is pawing at you, but there may be underlying “rewards” that are reinforcing the behavior and you may not be aware of. For instance, attention. Many dogs love attention, they will do what it takes to get it, and to a dog who has been bored and lonely all day, any type of attention, even the smallest teeny ounce of it, or heck, even attention of the negative type, will do! Dogs owned by people who work long hours each day, are often the poster child for this type of attention-seeking behavior. These socially deprived dogs have likely been waiting all day for their daily dose of attention and mental stimulation. Bored, and with little left to do, for these latchkey pooches, the owner’s return is likely the biggest perk of the day. If the owners comes home and walk Rover or plays with him in a way to fulfill his social or mental stimulation needs, great! Most likely the dog will then settle and gnaw on a bone when the owners decides to watch TV, but what happens when the owner comes home from work, ignores the dog and then plops himself on the couch to watch TV? You got it, Rover will try to do anything to get a bit of attention. So he may try pawing, and since the owners look at him or talk to him or push him away, bingo! Rover got his slice of attention, so he’ll keep doing it more and more! OK, maybe you are not giving your dog negative attention, or maybe your dog is not lonely and bored, then perhaps at some time or another, you may have inadvertently reinforced the pawing behaviors. For example, say you were on the phone and were really focusing on a conversation. Here comes Rover and since your are sitting on the couch which is where you often pet him, he paws at you and you inadvertently end up petting him. If your dog loves being pet and this scenario repeats every now and then, he will likely think that pawing is a good way to get to activate your hands to start petting him. Next, you are stuck with a dog pawing at you, and you cannot figure out why! “My dog though paws mostly at people, like guests in my house, what should I do?” In this case, be aware of the habit of social pawing. Social pawing is the tendency of some dogs to paw at people in hopes of getting attention. Your dog may just walk up to a guest and paw at him. What does your guest do next? “Awwww, you are soo cute! ” followed by many friendly pats and caresses. This may not seem really like a major problem, but soon, your dog learns that this is the best way to interact with people and a guest one day may get upset when Rover leaves muddy paw prints all over her white pair of pants, or worse, her child gets scratched by a dog pawing with long, sharp nails. To understand this, let’s pretend to be in Vegas. You spend a month in Vegas having the fun of your life playing the slot machines. The first day you don’t win, but then the second day you win a nice amount. You then spend the rest of your month playing every single day in hopes of winning again, and then, just before leaving, you eventually win again. Now, you are stuck with a gaming addiction and at least twice a year you must make a trip back to Vegas, what happened? What happened is that those random wins have rewarded your persistence and now you are stuck with an addiction. Back to dogs, if you reward those unasked-for pawing behaviors every now and then, you risk being stuck with a dog who has been rewarded for persistence and will therefore be pawing at you more and more in hopes of winning the slots ( that is, getting his slice of attention.) This means that you’ll be stuck with a stubborn pawing behavior that can be quite tough to extinguish if you don’t know how to tackle it, but fortunately, there are some easy ways you can work on it if you are willing to hold your ground. Well, for a good reason some dog trainers have given up training dogs to “shake” or “give paw” in classes. Things can get out of hand at times (pun intended,) but now that you understand the dynamics behind pawing behaviors in dogs, you are better equipped to stop this behavior. How? 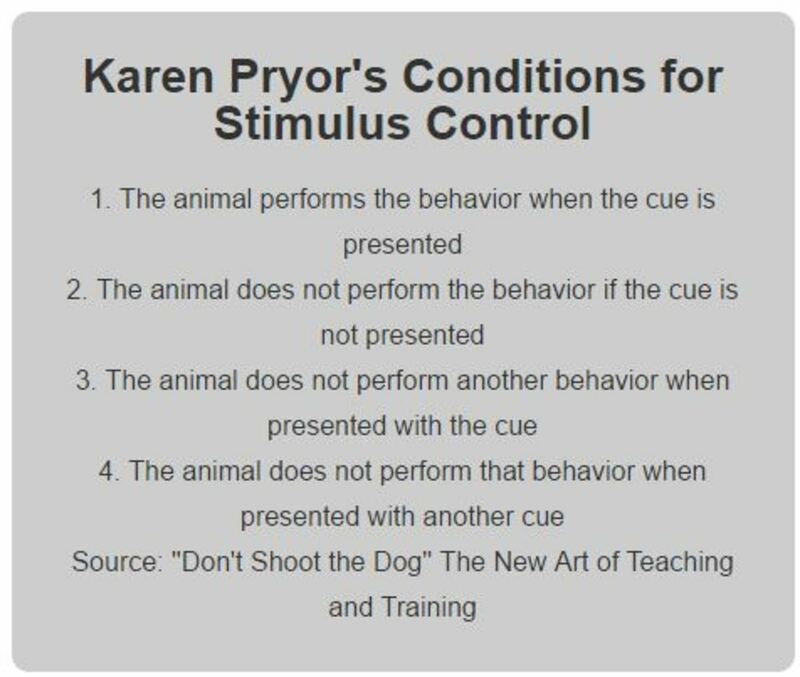 You put your dog’s pawing behavior under stimulus control. -If you own a bored dog who is pawing at you to gain a physical connection in hopes of doing something, make sure you go to the root of the problem and meet your dog’s needs for, exercise, mental stimulation and social interaction. 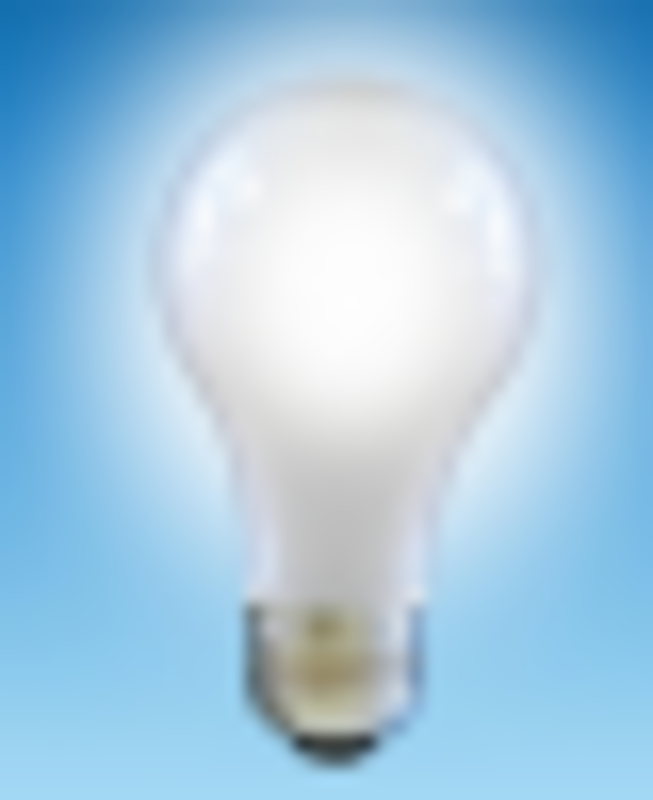 -Want to take a little break in the evening and watch your favorite show? When your dog paws at you, ignore him, and then when your dog gives up and leaves, call him to you, ask him to sit or lie down and reward him by giving him an interactive toy that will keep him occupied for some time such as a stuffed Kong or other long-lasting goodies. -Is your dog pawing at you, but you never taught him to “shake?”Training your dog to give paw on cue, can actually help you attain better control of the behaviors. 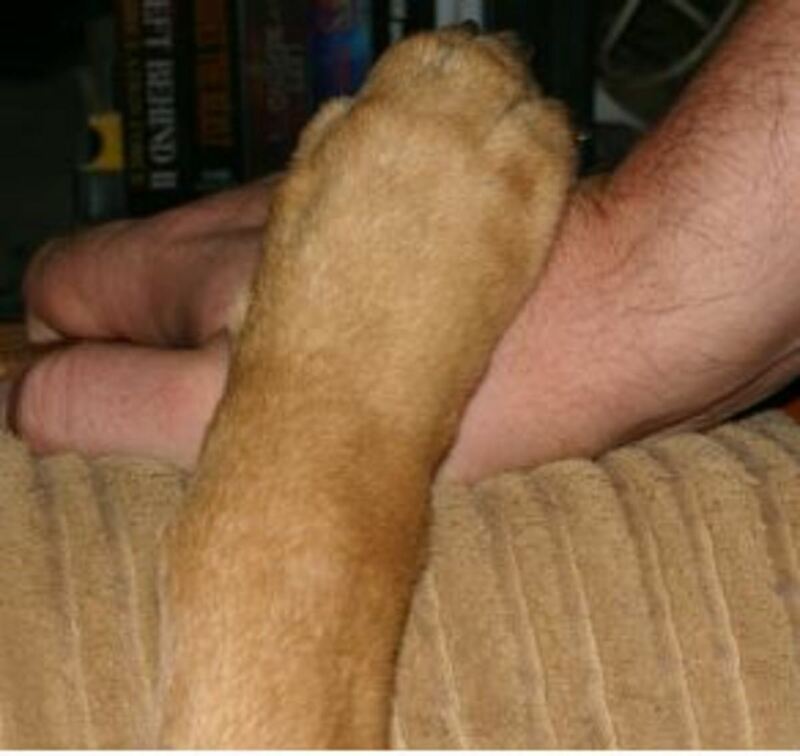 Here’s a quick and easy way that is often used to train a dog to give paw. All you will need is a clicker (alternatively, use a verbal mark such as “yes!”) and some tasty treats. Present your open hand with a treat sitting on the palm. Let your dog eat it from your hand and then repeat one more time. Next, close your hand. Your dog may nudge at your hand for a few times and then when frustration kicks in, he may eventually try pawing at it. When he does, make sure you mark that behavior with a clicker or a “yes!” and open your hand letting him access to the treat. Repeat several times, and then at some point, when the behavior occurs more frequently, make sure to pronounce the verbal cue “paw” right before he paws at your hand and click and reward as soon as does. Soon, you’ll have a dog who will give paw upon hearing the verbal cue. 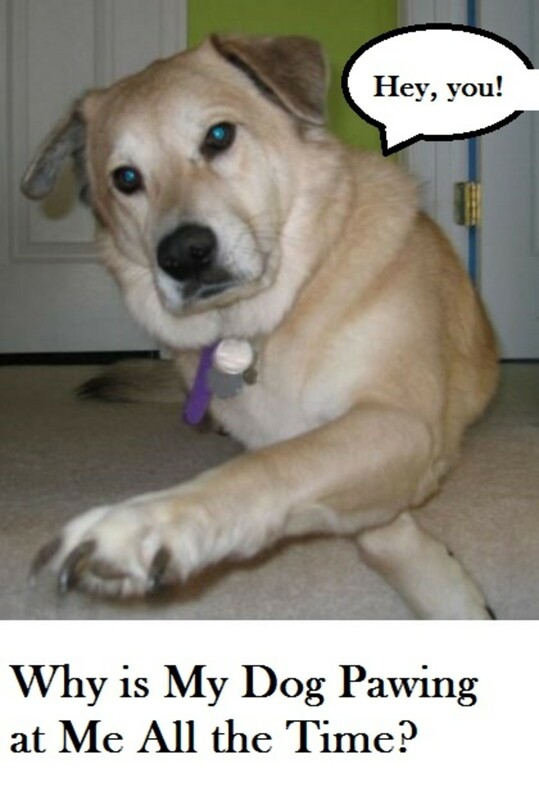 Have a dog who loves to give paw and use his paws? Why not open up a world of “pawsibilities” to expand your dog’s repertoire of cool tricks? Teach your dog to high five, salute, wave, say his prayers or cover his eyes. If your dog is bored or you are looking for some fun rainy-day activities, then why not teach him to use his paws to turn buttons on and off, switch on lights, file his nails by pawing at a sandpaper board or even play a battery-operated piano? There are many fun activities you can train your dog so he can put his natural “pawsy” tendencies to good use. A win-win, situation for all! Did you know? Just like us, dogs have paw preferences. Some dogs are mostly left-handed while others are mostly right-handed. Is My Puppy’s Rapid Breathing Normal or Should I Worry?